Fish Everglades National Park & the 10,000 Islands! Chokoloskee Charters - "Fishing the Park since 1972"
Capt. Charles Wright welcomes you to Chokoloskee Charters. When you come to Marco Island, Naples, Everglades National Park and the 10,000 Islands, you have reached the very edge of the Florida's last frontier. Fly fishing and sight fishing in the Florida Everglades is fishing at its best. 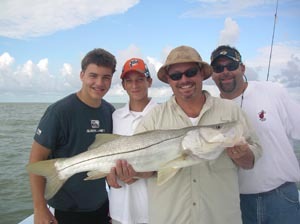 Come enjoy fishing the Everglades for snook, tarpon, redfish, cobia and grouper. We are located just a half hour drive from Naples & Marco Island, 90 minutes from Miami, Ft. Lauderdale & Ft. Myers: and less than two hours from Boca Raton, & Palm Beach. "Best the State has to offer"!!! Why fish Naples or Marco Island when Everglades National Park is only 30 minutes away? The Everglades National Park and the Ten Thousand Islands are a traveling fisherman's ideal destination. It is one of the most pristine and productive fisheries in North America. Equally important, however, is the weather. How many times have you had your trip hurt by weather? For the light tackle and fly fishing angler, the area's vast expanse of protected waters means that weather days are virtually nonexistent. There are always sheltered places to fish. You will not spend your fishing days inside waiting for the weather clear. Never do you have to fish in the wind all day!! Chokoloskee Charters offers you many different adventures: Fly fishing (or spin fishing) Snook and Redfish on a technical poling skiff, Everglades Tarpon fishing the rivers, beaches or the deep backcountry of Everglades National Park, catch Permit, Cobia. Grouper and Kingfish on near shore structure, wrecks and artificial reefs in center consoles and flats skiffs or Kayak Fish where others simply can't go. You can also take your family for an experience isolated beach for fishing, shelling and picnicking on a Guided Eco-Adventure Tour. Florida Kayak Fishing is the best it can be in Everglades National Park and Everglades City. So why go to crowded Marco Island or Naples fly fishing when you can enjoy the "Best fly fishing in the World" ... Fly, spin and bait fishing Everglades National Park and the Ten Thousand Islands with Chokoloskee Charters.